Microscopic description: The smears show numerous tissue fragments in a background of abundant “dirty” necrosis with prominent karyorrhectic debris. Some of the tissue fragments show well-oriented columnar cells at the periphery, suggestive of the classic “picket fence” arrangement. 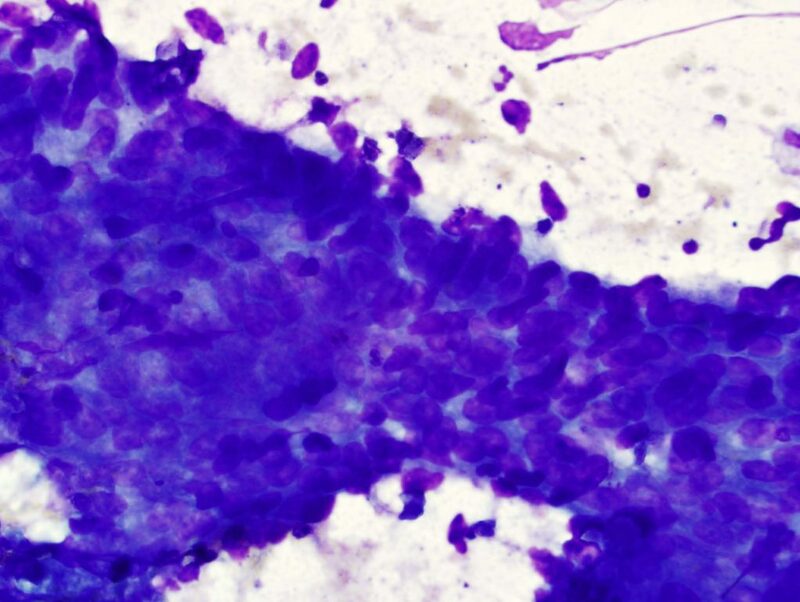 The tissue fragments are composed of mildly pleomorphic cells with increased N/C ratio and hyperchromatic oval to elongated (“cigar-shaped”) nuclei with occasional nucleoli. 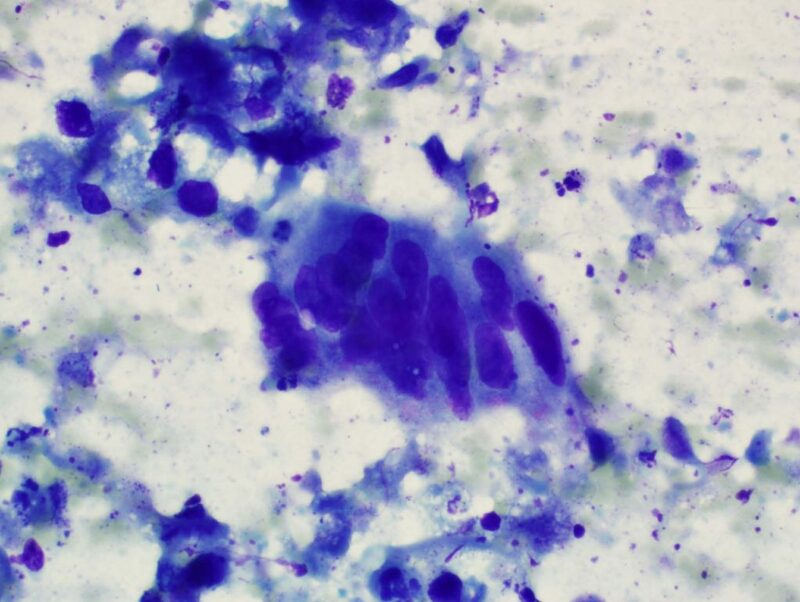 The cells have a moderate amount of cytoplasm with no overt mucinous differentiation. Differential diagnosis: The most common primary sacral tumor is chordoma, characterized by epithelioid cells with vacuolated cytoplasm in a background of matrix material. Metastasis are more common than primary tumors in this site. Multiple myeloma and lymphoma are relatively more common, but would be characterized by discohesive cells rather than tissue fragments. 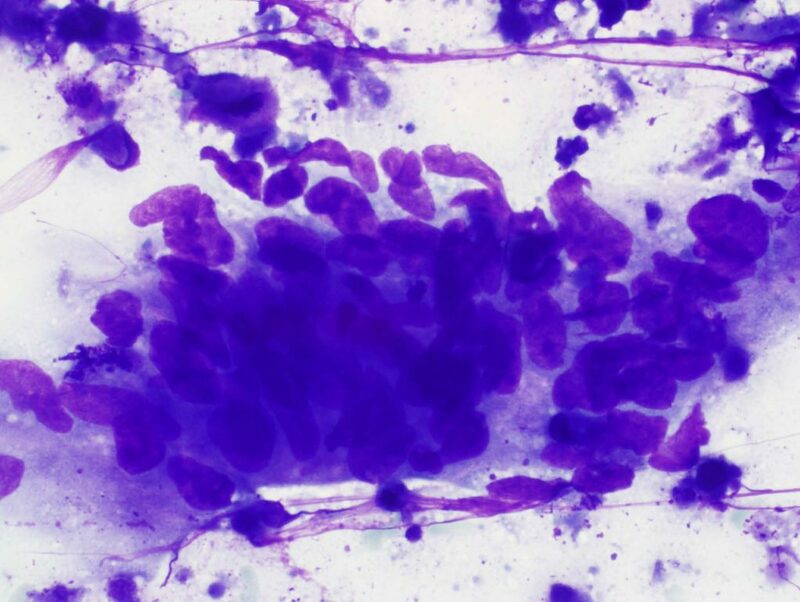 Features suggestive of prostatic adenocarcinoma include small monomorphic glands, cells with prominent nucleoli, and lack of mucin secretion. Melanoma is commonly characterized by spindled and/or epithelioid cells with prominent nucleoli, pseudoinclusions and, in 50% of cases, melanin production.